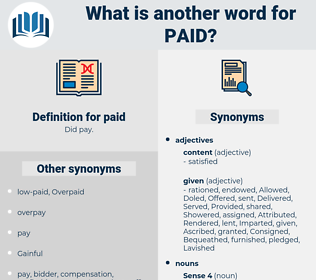 What is another word for paid? payments, remunerative, salaried, interest-bearing, fee-paying, Gainful, income-generating, well-paying. appropriations, developments, sums, Has, states, boosts, figures, payments, gets, makes, payment. Participated, played, applied, laid, representative, Reimbursed, Expenditures, attention, allowances, Passed, hailed, accepted, concentrated, addressed, responsible, demonstrated, expenses, page, implemented, Caught, Charges, appropriate, appropriated, prepared, approved, tribute, perceived, update, appointed, careful, dedicated, deducted, dissemination, Praised, homage, devoted, supported, price, deserved, advanced, expenditure, sustained, expressed, adjusted, subsidized, officially, authorized, collected, Carried, acquired, ready, purchase, purchasing, Purchased, Explored, employed, subsidised, maintained, Contributed, tax, disbursement, redistributed, Spanned, authorised, developed, withheld, organised, Undertook, Achieved, Embraced, declaration, Levied, invoice, invoices, Followed, restored, earned, pointed, presented, Incurred, agreed, published, spending, spent, Transferred, Pleaded, benefits, Examined, Assessed, sponsored, Proffered, welcomed, acquitted, organized, accordance, surrendered, Operated, watch, follow-up, bore, Channeled, handled, reflected, imposed, elevated, Bought, Issued, Submitted, pronounced, covered, honour, honoured, provoked, distributed, facilitated, owed, Swore, rebate, initiated, contained, procurement, pursued, expanded, statement, suggested, instructed, financed, Yielded, Accorded, accords, Records, transmitted, spoke, focused, focussed, refunded, considered, Helped, Enshrined, burden, formal, scope, informed, wrapped, dispensed, opened, included, moved, Deposited, assumed, produced, relation, shouldered, pledged, concerned, discharge, Convened, Rated, Spurred, solved, continued, committed, fulfil, fulfilled, Wiped, Attracted, Hashed, allotted, retained, hired, identified, concluded, Bribed, executed, engaged, handed, directed, signified, extent, monitoring, monitored, award, awards, Wore, place, placed, Envisaged, noted, caution, cleared, Prompted, invested, Strapped, proved, lost, inspired, kept, released, Cared, traveled, travelled, Filed, entrusted, retired, Incited, processed, visiting, Visited, Referred, centred, conceded, derived, centered, donated, thrust, Borrowed, Rendered, With, Catered, Tackled, increased, Earmarked, Discussed, Flew, determined, mandates, Contended, percent, Propelled, struck, conferred, Obtained, showed, initial, drew, provide, Reached, garage, Raided, Spilled, involved, announced, Claimed, Exercised, Became, load, loaded, loading, loads, Argued, selected, Allowed, Created, used, Launched, to, fresh, granted, Granting, Grants, read, height, dropped, sent, Dealt, intended, added, Accounted, extended, posted, return, Returned, Loaned, staged, forced, decided, pitched, Offered, Wished, versed, footed, Remained, tipped, pushing, Pushed, led, ordered, tasks, fixed, Consisted, Served, heard, held, Poured, broke, Told, look, Looked, turned, found, -rrb-, shot, effected, Brought, Urged, touched, called, prize, Threw, put, lent, Came, sought, Asked, Killed, Entered, Gave, Worked, landed, Lived, drove, set, Boosted, hosted, Tended, Caused, Resulted, guys, one, Occurred, dear, ruled, fired, controlled, raised, bid, requests, Voted, size, Went, Was, Were, Listened, missed, Took, Acted, formed, meeting, Met, me, Had, funded, funding, tied, let, Did, DO, dated, She, Got, shed, 'il, makes. reimbursement, repayable, reimbursements, played, attentive, Reimbursable, applied, laid, Reimbursed, Passed, accepted, concentrated, employment, addressed, Investigated, accompanied, incorporated, honoraria, Forwarded, Afforded, demonstrated, Materialized, emphasised, expensed, page, Accommodated, Eliminated, understood, commensurate, implemented, Caught, appropriated, accomplished, apportioned, prepared, approved, Incomes, perceived, coverage, Indemnified, repaired, commissioner, vigilant, Administered, Adjudicated, Unliquidated, consolidated, appointed, accumulated, experienced, occupied, relinquished, dedicated, Subordinated, illustrated, Exempted, refundable, deducted, priced, devoted, supported, Sacrificed, deserved, advanced, withdrawn, expenditure, sustained, guaranteed, removed, harmonized, expressed, resourced, interested, adjusted, subsidized, highlighted, endeavoured, authorized, collected, saved, ', integrated, recognized, recognised, Carried, acquired, Deployed, Purchased, employed, terminated, anticipated, subsidised, replaced, Taxed, Taxes, kidnapped, Disseminated, maintained, Extracted, Compared, Contributed, Liquidated, tax, dispersed, disbursement, Mapped, Undertaken, cancelled, Canceled, Spanned, calculated, Captured, authorised, developed, corrected, withheld, organised, pleased, obligated, reallocated, Achieved, postponed, species, separated, serviced, strengthened, associated, Remedied, declaration, incidence, Defaulted, Levied, blamed, attempted, documented, Managed, invoice, invoices, Followed, restored, earned, pointed, Enjoyed, Installed, accused, established, absorbed, presented, attended, Incurred, Benefited, amended, Retrieved, agreed, Appended, deprived, prescribed, published, accrued, Approached, regard, Regarded, spending, spent, Transferred, Examined, Generated, Watched, Assessed, sponsored, Rewarded, impacted, Ascribed, born, Borne, located, Channelled, acquitted, organized, collectible, arranged, spread, expended, designated, Instituted, Delivered, planned, surrendered, Operated, watch, clarified, follow-up, overcome, realized, sworn, rebated, Complied, handled, reflected, imposed, Upheld, calibrated, disputed, Bought, Issued, disclosed, regulated, Submitted, pronounced, covered, Arrived, honoured, distributed, Adduced, facilitated, scheduled, owed, observed, measured, utilised, described, initiated, contained, timed, pursued, recorded, expanded, gathered, statement, forfeited, refund, upset, instructed, Advocated, written, admitted, satisfied, disposed, financed, foreseen, Yielded, Accorded, help, Receipted, Defended, transmitted, pressed, quickened, focused, focussed, refunded, considered, Consulted, justified, abducted, Computed, governor, Harvested, checked, Helped, Enshrined, Compiled, scope, declared, informed, Suffered, confined, compelled, treated, noticed, respected, qualified, condemned, opened, diverted, warranted, included, Forgiven, moved, evidenced, registered, discharged, Deposited, assumed, learned, Notified, Introduced, produced, offset, Supplied, furnished, affected, utilized, shouldered, pledged, embodied, concerned, Inserted, assisted, supposed, Convened, rectified, entitled, Spurred, solved, continued, committed, fulfilled, reviewed, Attracted, revised, motivated, Insisted, bestowed, projected, Recruited, Sentenced, worn, specified, allotted, retained, hired, identified, concluded, governed, permitted, sampled, Challenged, aligned, executed, engaged, changed, handed, directed, proven, licensed, monitored, Dragged, dumped, relieved, Endured, converted, placed, restricted, merited, noted, cleared, Prompted, Rights, powered, invested, Targeted, circulated, Exacted, redeemed, impelled, proved, modified, lost, care, inspired, wasted, kept, destined, released, Comprised, enforced, Cared, travelled, Filed, entrusted, Slipped, Stalled, retired, Incited, processed, Visited, Referred, centred, conceded, derived, centered, Screened, donated, reduced, Flown, thrust, Borrowed, Rendered, Aimed, Tackled, honored, increased, Shown, Earmarked, estimated, cashed, exposed, Discussed, maximum, determined, Shipped, drawn, $, punished, Subsided, struck, conferred, Obtained, Subjected, owned, insured, outlined, Spilt, finished, provide, Gained, Bridged, ranked, Reached, triggered, women, studied, Spilled, mobilised, convicted, become, Demanded, involved, secured, announced, Claimed, chosen, guided, obliged, filled, Exercised, worried, loaded, combined, started, Argued, selected, Begun, Allowed, Created, sealed, Lodged, used, Launched, fresh, reversed, Devolved, ensured, fed, granted, Marketed, divided, breached, hurt, sent, Dealt, intended, designed, added, Denied, Accounted, extended, failed, freed, posted, Returned, Loaned, booked, forced, assured, decided, Offered, geared, expected, versed, Remained, defined, posed, Pushed, shared, vested, led, ordered, cured, enough, fixed, Served, heard, held, suited, art, Poured, input, stored, reserved, thrown, Looked, turned, found, -rrb-, inclined, shot, headed, effected, Brought, Urged, touched, Plunged, come, called, seen, tabled, given, put, lent, sought, Asked, felt, driven, Entered, Tendered, limited, pinned, wired, HIT, grown, Worked, landed, Viewed, needed, induced, set, Answered, i.e., fuelled, tested, risen, tried, based, Caused, Resulted, Occurred, model, Died, thought, ruled, controlled, joined, raised, matched, Emitted, requested, aid, gone, bound, Voted, stated, 163, taken, Listened, won, Counted, ended, backed, 2004, tuned, S, Been, Acted, Met, have, Had, funded, tied, let, figured, sorted, Meant, dated, run, Gotten, Got, shed, deaf, Has. accrue, disburse, afford, cover, foot, owe, extend, meet. imp., p. p. & a.
buckshee, gratis, gratuitous, free, pro bono, costless, undischarged, owing, unprofitable, uncompensated, nonprofessional, unsalaried, complimentary, rent-free, outstanding. amateur, circular, free-lance, freelance, round, salaried, self-employed, unprofessional. Oh, she'll get paid for it! My poor friend, paid Edwin deeply agitated, you will, you must get into practice again.